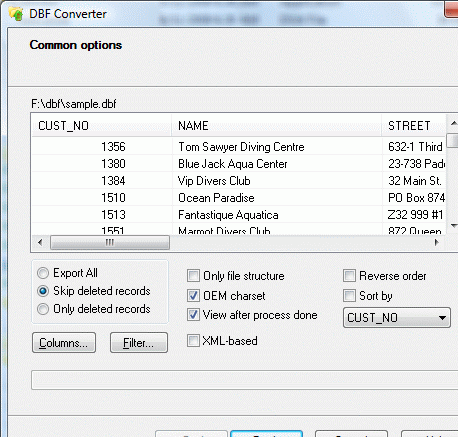 This is a software converter for DBF format files. dBase, FoxPro and their Windows clones, Delphi applications and others rely on DBF files. They have been one of the most popular data files. As you move up to more current applications and tools like the recent databases, it is required that the data locked up in these files be converted into formats suitable for these applications. There`s a large need for data interchange and compatibility arising from these compulsions and other needs. Thus even a very useful database program is not very helpful unless this data interchange needs are satisfied. Unlike many other DBF tools, this product is able to access low-level data and thus give you maximum flexibility. Whether the need is the ability to publish the data on the web or get the DBF data into SQL databases this converter can help you out. The interface is absolutely simple. You select the database file, choose the operation you want and that is it! All the options are presented on the interface with the operations displayed with radio buttons that need to be clicked to choose. The tool also presents a command line interface making batch operations quite simple. The formats to which the data in DBF can be converted to include Excel, XML, CSV, TXT, HTML, RTF, PRG and others. It is possible to convert a DBF file into a SQL script and imported into a SQL database. It would be possible for you to select specific columns and apply filters to the data to choose only the type of data you need to convert. If you have a lot of data locked up in DBF files, that need further processing to be of value to your organization, here is a handy tool to do just that!